Both of my kids love Thomas the train! Merry Christmas Thomas is no exception. With all of the Thomas movies and shows there are always lessons to be learned. in "Surprise, Surprise," my favorite part of the show, Thomas is trying to make a surprise party for his friends who have broken down and are in the Steamworks shop. They can't make it to the special party with the children, so Thomas secretly begins planning a party at Steamworks for the engines without clearing it with Victor the shop owner. Things keep going wrong as Thomas brings a friend to share jokes, and later a Christmas tree. When Thomas finally tells Victor, the shop owner whats happening, things turn around as they all help to make the party come to life. A lesson learned: you don't have to do everything by yourself, nor should you think you have to. Other lessons are learned as Thomas searches for the "grandest tree", as well as when the engines sing a song in hopes for a "winter wonderland." Out in time for your Christmas and holiday enjoyment. Get Merry Christmas Thomas for your holiday collection! Your kids will love the fun! 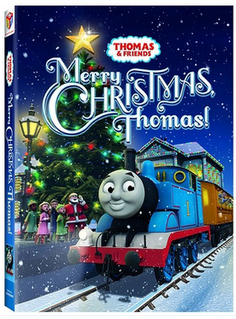 One reader will win Thomas & Friends: Merry Christmas Thomas DVD! US only. If you have already received this title in a giveaway, you are not eligible. Giveaway will end Tuesday, November 15th at midnight MST. Winner will be chosen by Random.org. I was given a DVD to review, no other compensation was received. Email addresses will be deleted after giveaway. If you've won a copy of this DVD in another contest, you are not eligible for this contest. Your privacy is important. US residents only. I follow Tightwad on Twitter. I follow Tight Was with GFC.